Melissa,from Melissa loves, here... I am so honored and happy to be over here on Traci's beautiful bliss. Thank you for entrusting me to help take care of it while you are gone my friend. Traci is one of those people, that I have met in my blogland travels, that I instantly loved and felt a great kinship with. It is funny to me that we have never met....yet, I feel as if we have been friends forever (one of the lovely things about this community). I am inspired by Traci,her beautiful personality and her wonderful way of seeing things. So, I thought it was only appropriate that this guest post be about her and how some of that inspiration transpires. 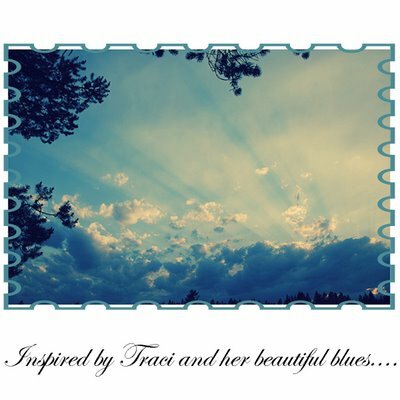 To me, that is one of Traci's signatures....the beautiful blues that float through her images. That it is a part of her lovely way of seeing things. 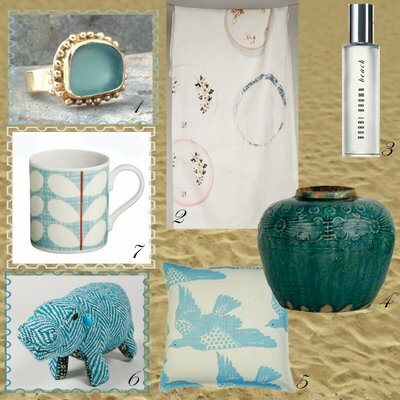 I love the color blue so very much. All shades~ it's richness and depth, it's promise of hope and good things to come. Like a bright beautiful sky on a perfect spring day or a wonderful day at the beach. It is not surprising that Traci also adores the beach....So, inspired by her beautiful image above...I collected some things I thought she would like and that I would give her if I could. I hope you all like them and Traci, I hope you are having a glorious blue sky day, wherever you are.